This post was sponsored by Kinderbut the content and opinions expressed here are all my own. If you find yourself missing those days and scrambling on how to entertain your own children at home, consider making them part of the kitchen. Find easy to make recipes in which you can involve them. My son for example loves cutting up his own strawberries. Not only is it empowering, but it helps with his motor and math skills. (of course, always supervise your kid and make sure they use age-appropriate cutting utensils). Another way of interacting with your children in the kitchen is by them helping you in sorting out the rice and/or beans. I have fond memories of sorting the beans with my mom. I somehow think that made me appreciate her cooking that much more and where the love for my cooking began. It’s also super fun to watch your kids face when you eat something they have made. And really, who doesn’t love a warm bowl of frijoles de la olla on a gloomy day? (I have a great frijoles de la Olla recipe here). Of course, after we eat we always leave room for dessert or a special treat. Both me and my son are obsessed with Kinder Joy’s surprise eggs. If you are one of the few who has yet to taste these delicious treats, they consist of two separately sealed halves – a treat side made of two deliciously creamy layers and a second half containing an exciting mystery toy. They toys are always the best, my son always loves them. I also have a sweet spot (no pun intended) for Kinder Joy’s eggs. After we cook (and eat), we move playtime to his room. One of his favorite games right now is bowling (our version anyway). We line up all his toys in a single file line, then we take a few steps back and roll a ball towards them, counting how many of his toys we can knock down at once. This keeps him entertained forever. He also loves to play hide and seek with me and his toys. He asks me to count and hides toys all over his room. I think he loves the idea of me finding something he has hidden. Brings him so much joy when I find them. 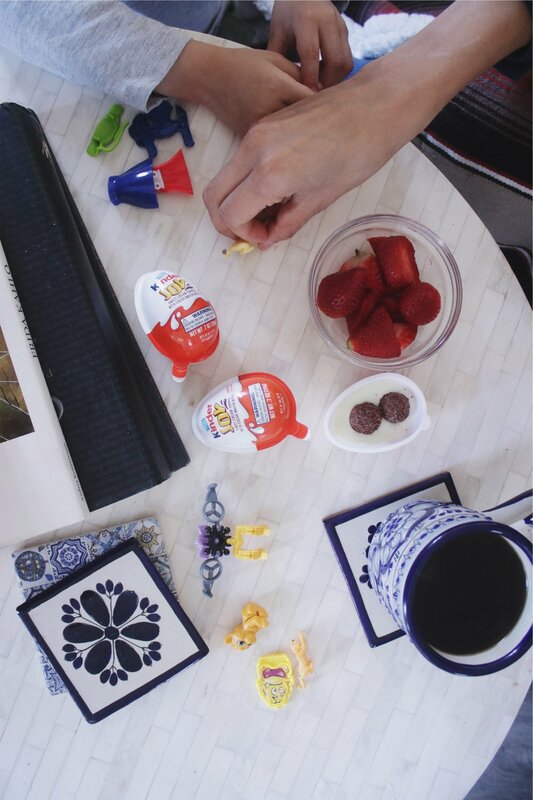 We absolutely love to use his Kinder Joy mystery toys for these two activities. They are the perfect size and being able to assemble them only adds to our experience. Kinder Joy has been around the world since 2001 and sold in 170 countries. And did you know that over the past 17 years, billions of eggs have been sold??? I have most definitely contributed to that number. Also, on days like these, make it appoint to relax your mid, when sitting to play with your kids. I know first-hand how difficult this could be. Our minds as moms are always thinking about a million and one things. But practice relaxing your mind and being present every day. Little by little you’ll become a master! 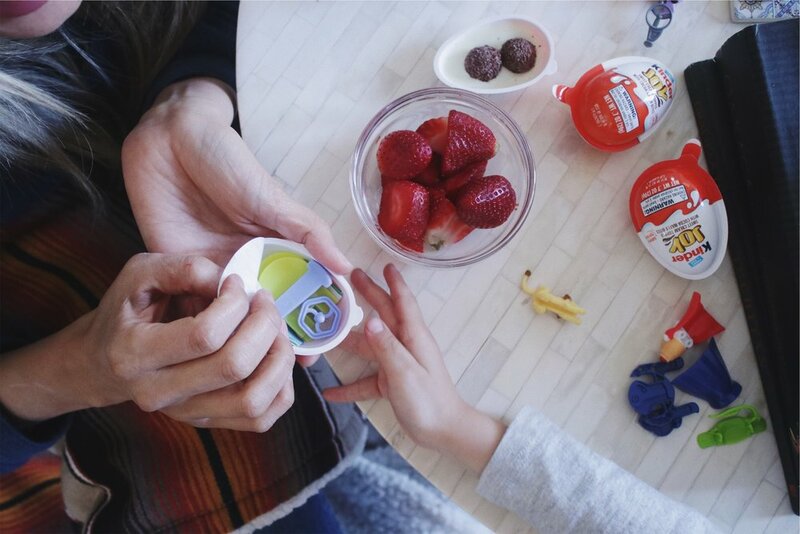 Remember that Kinder Joy is officially available in the U.S. Cheers to those gloomy LA days ladies! Posted on February 21, 2018 by Bricia Lopez.